When a conference is called a celebration you know there is something else going on. I was fortunate enough to go to Disney Social Media Moms last year, and this year I went again, but this time to Disneyland in California. And, since the celebration coordinated perfectly with my daughters’ spring break and Passover we decided to make it a real family trip and stay in Los Angeles to have our seder with all of our family that lives there. It was Kismet. And I’m happy to say, my daughters still loved it, even as jaded tweens. One of the things I love about this conference is that they don’t tell you the full agenda and all of the surprises that are in store while you’re there. And, they include so many different facets of Disney – so there are always unexpected and interesting people and initiatives worth learning about. 1. Cars Land is spectacular. No, really. Ever wonder what it would be like to step inside an animated film? Well, this is pretty much as close as you will ever come. 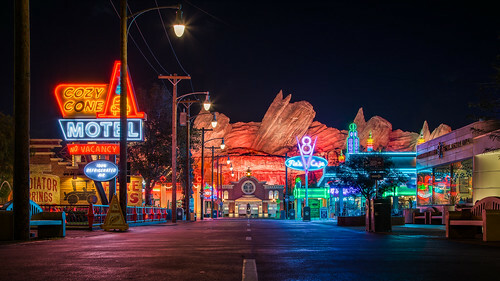 I recommend going at night when the full neon glory of Cars Land is lit up and you can be immersed in the 1950’s vibe. The Radiator Springs ride is crazy fun – and the backdrop landscape of Route 66 is genius. There is also royalty of a different kind – a CEO who built a business from scratch and is now using her success for empowering students and teachers. That’s Chief Exec Bear, Maxine Clark, founder of Build a Bear Workshop, who spoke to us about teachers – good and bad – and the impact they have on children’s lives. Hearing from incredibly successful women entrepreneurs is always inspiring, but there’s an even stronger impact when it’s someone like Maxine Clark who is also honest and supportive of other women entrepreneurs. And I love that she started Build a Bear with an underlying belief that every child should be able to buy a basic bear and fill it with love. 4. There is magic, everywhere you look. When you spend time with the people at Disney you quickly come to realize how incredibly talented everyone who works at Disney is, and how diverse those talents are. But, more importantly is this belief that every cast member has a creative spark that can be brought out. NextHurricane Season Starts June 1st: NYC Know Your Zone!